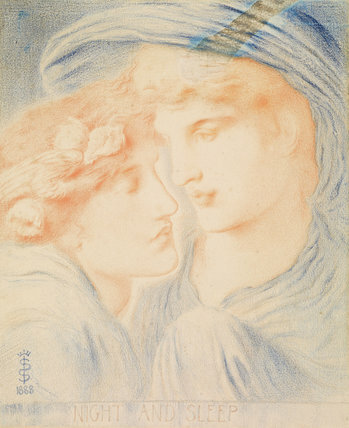 Heads and shoulders of two androgynous figures: the female figure, almost in profile to the left, enfolds in her drapery and looks down on the male figure, almost in profile to the right, his eyes closed, a wing and three poppies protruding from his hair. The female figure's left hand, covered with her robe, is raised slightly. 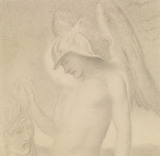 Night and Sleep is written below the image. Blue and red chalk on paper.